The end of 1895 had seen British South African Company (BSAC) forces, under the direction of Cecil Rhodes, launch an attempted invasion and coup against the South African Republic. The action, which became known as the Jameson Raid, was a total failure, but the political fallout in Britain was immense, with a particular focus on the relationship between the Chartered Company and the conspiracy. 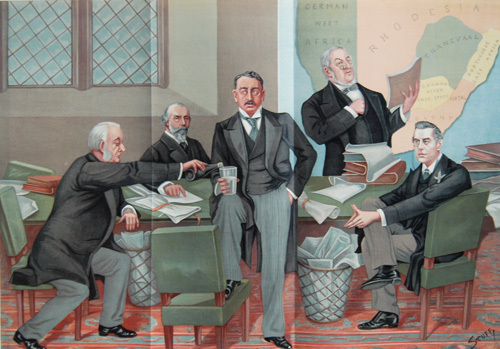 In seeking to further our understandings of the nature of British imperial expansion, the Jameson Raid might seem like an odd choice of focus by comparison with other episodes in Imperial South African history; although an important precursor to the South African War of 1899-1902, the Raid itself provided no territorial gains for the Empire, and indeed arguably weakened the British position in the region. However, an analysis of the political controversy generated by the Raid in Britain, and particularly the public rhetoric deployed by political actors, provides real insight into how the expansion of the Empire and the forces of imperialism operated as political issues within late-Victorian Britain. when left to their own devices and without control have not been fortunate. They have been defined as a valuable instrument for the cheap extension of Empire. We have been told that they are a means of obtaining power without responsibility, and wealth without expenditure, but we may find that we pay too dear a price for this. There is no power in the world which is not accompanied by responsibility. This constituted an attack not just on BSAC itself but on the very model of capital-driven arms-length imperial expansion which it represented: the ‘cheap extension of Empire’ ultimately costing Britain by entangling it in new imperial obligations. A particularly notable feature of this Liberal critique was a rhetorical focus on the financial element of the Jameson conspiracy. The fin de siècle of course did see the emergence of financial-orientated theories of imperial expansion within British Liberal circles, with J. A. Hobson’s Imperialism: A Study (1902) perhaps representing the most prominent example. In terms of the politics of the Raid, however, Liberal allusions to finance perhaps owed less to such theories and more to the pejorative connotations of money-making in the imperial context. ‘The whole spirit of this transaction’, Harcourt asserted, ‘has been the spirit of Mammon’, and declared that now ‘one of the most serious matters for us to consider is to see how far this accursed thirst for gold has eaten into the spirit of the English people.’ This then was a moral critique, calling into question the character of BSAC’s imperialism – and critically, implying that it posed a risk to the wider character of the nation. …if we are to tell our colonies, we are to tell the world, that the spirit by which we are accentuated is only this: ‘Put money in thy purse,’ and then call it the expansion of the Empire and the progress of civilisation – what effect is such a doctrine going to have in our Empire itself? The suggestion of a threat to the existing Empire is also implicit in this critique of the profit motive for imperial expansion. By making use of such rhetoric, Harcourt and his colleagues could thus adopt positions which appeared supportive of Empire, while at the same time attacking the expansionist imperialism that the Raid, and by extension BSAC, represented. An examination of the political fallout from the Jameson Raid thus serves to highlight the degree of nuance present within British imperial politics in this period, and can do much to illustrate the party political framework within which ideas of imperial expansion were understood and articulated. What then of globalisation? Did the events of the Raid see late-Victorian Britain engage with a globalised politics of imperial expansion? Analysing such a consideration is probably beyond the scope of this inquiry, although it might certainly be suggested that the South African question was a political issue with a global audience (at the time of the South African War, for example, a recurring theme in political debate concerned the extent to which words spoken to parliamentary audiences and the domestic electorate risked encouraging Britain’s enemies or alienating settler sentiment). Yet what we might note from this exercise is the persistence of many of the tropes of the politics of imperial expansion in political rhetoric today. Attacks on the morality of profit-driven expansion, concern that governance on the cheap does not prevent the spread of responsibilities – these are elements which can be recognised in many of the debates accompanying globalisation today. Ultimately then if the politics of British imperial expansion cannot be seen as part of the politics of globalisation, it may nonetheless have been a forerunner of it. Sir William Harcourt, House of Commons debate, Hansard 8 May 1896. See, for example, the juxtaposition between corporate gain and public risk in the debates over the Transatlantic Trade and Investment Partnership. Rhodes and Jameson had plenty of other examples from history to try to justify this totally immoral adventure. One has only to look at the activities of Spain grabbing gold from the Aztecs and the Incas. Charters issued to people like Drake and Hawkins were thinly disguised forms of robbery. One little war that seldom gets mentioned is the equally disgraceful war against the delightful Ashanti nation who quite rightly objected to the British encroachment into their territory. My problem is seeing how any honest person could start to justify any of this disgraceful behaviour. All That Glittered, Selected correspondence of Lionel Phillips, M Fraser & A Jeeves , springs to mind. The role he played in the JR to my knowledge, has not been fully examined. Also, his subsequent role in the mining industry, and in British society, is worth consideration.